Mars' Gillespie Lake outcrop on Mars — shown here in a photo taken by NASA's Curiosity rover — shows possible signs of ancient microbially induced sedimentary structures, according to a recent study. But Curiosity scientists say the features likely result from abiotic processes. Intriguing features photographed by NASA's Mars rover Curiosity probably don't have a biological origin, mission team members say. 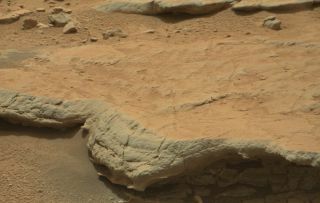 An outside researcher recently analyzed photos Curiosity took of an ancient sedimentary outcrop called Gillespie Lake, and noted some similarities to "microbially induced sedimentary structures" (MISS) here on Earth. Study author Nora Noffke, a geobiologist who is not a member of the Curiosity team, said the Gillespie Lake features could be consistent with a biological origin, but stressed repeatedly that this was just a hypothesis, and that she didn't regard the structures as proof of past Mars life. "We really didn't see anything that can't be explained by natural processes of transporting that sand in water, and the nature of the rocks suggested that it was just a fluvial sandstone," Vasavada told Space.com. "We do have several members of our team who are always keen to look out for things that might be caused by biological processes, but there was no reason, we felt, to explore that [option] at that site," he added. "It came down to nothing exceptional, from our point of view, that wasn't just a consequence of erosion of this sandstone." Vasavada also stressed that he and the rest of the Curiosity rover team welcome analyses by outside researchers such as Noffke. An overlay of a sketch onto a photo taken by NASA's Mars rover Curiosity of the Gillespie Lake outcrop, showing intriguing structures on the rock bed surface. In a study in the journal Astrobiology, geobiologist Nora Noffke suggests that such structures could be signs of ancient microbial life on the Red Planet. The Curiosity team did decide to drill into a layer of fine-grained mudstone dubbed Sheepbed, which lies directly beneath Gillespie Lake within a broader region near the rover's landing site called Yellowknife Bay. SAM's analysis of the Sheepbed mudstone, along with other Curiosity observations, allowed the rover team to determine that Yellowknife Bay could have supported microbial life in the ancient past. About 3.5 billion years ago, the area was part of a lake-stream system that may have been habitable for millions of years, mission scientists said. SAM also detected organics in the Sheepbed sample, marking the first definitive detection of life's building blocks on Mars. "We feel that choice paid off," Vasavada said of the focus on Sheepbed. Curiosity landed inside Mars' huge Gale Crater in August 2012, then spent almost a year exploring the Yellowknife Bay area. It departed for Mount Sharp — which rises 3.4 miles (5.5 kilometers) into the Martian sky from Gale's Center — in July 2013 and reached the mountain's base last September. Mount Sharp has been Curiosity's main science destination since before the rover's November 2011 launch. Mission team members want to drive Curiosity up through the mountain's foothills, reading a history of the Red Planet's changing environmental conditions in the rocks along the way.